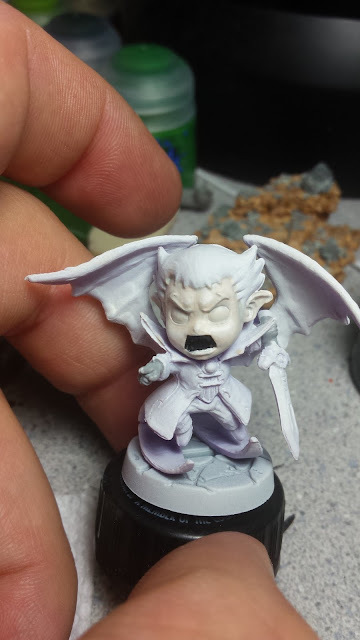 There are a few ways you can paint Chibi eyes. Some folks paint ovals, others do dots, some with black outlines, others without. Some paint pupils while still others forgo them. I paint large non-outlined partial ovals, without the pupil in the center. I find the pupil looks strange and the black outline seems unneeded. 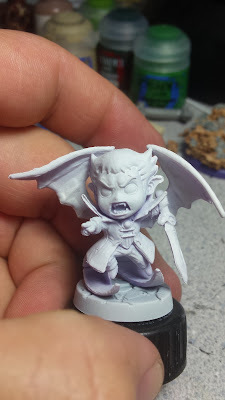 This tutorial is by no means the end-all-be-all of Chibi eye painting. 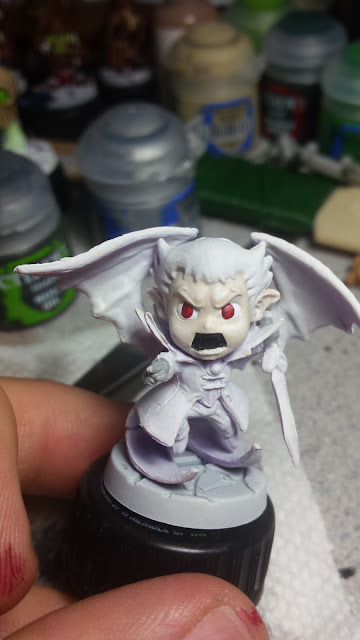 It's just the technique I've found to work best for me and the easiest to recreate, even if its a year between paint jobs. The eyes of all my Heroes. Only the Deeproot Druid and Star Guild Sapper have dots for pupils. This was done because of their expressions, which seemed more serious. 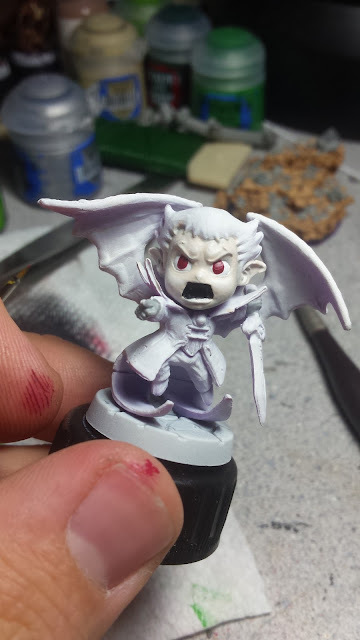 Remember, with Chibi minis, you don't need to use realistic eye colors. You can have black, bright pink, orange, purple, yellow, neon green, turquoise, the options are wide. But, it's important to note that the eye color will be 2 colors. We want a darker tone main iris and a lighter tone for the highlight. These are usually the same color, just different shades, but nothing is stopping you from going wild. Also, some colors don't work very well together, the orange eyes of my Nyan Nyan for example, should have had a brighter highlight color, possibly yellow for the highlight. Today we'll be using Von Drakk from Super Dungeon Explore: Von Drakk's Manor. I thin my paint with Liquitex Matte Medium and water. There are other additives you can use as well, you've just got to play with it and see what works for you. 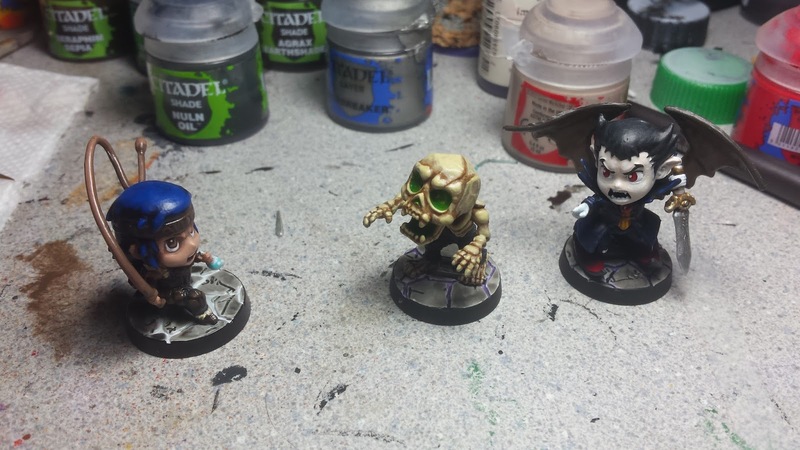 I prime my minis with Games Workshop's Skull White, but you could use a different brand. Be wary of Rustoleum and Krylon, I've has mixed results. Sometimes the chemicals in the spray react to the plastic of the mini. Due to the size and the camera on my phone's inability to get macro pictures, you may need to click on the images to get a better view of each step. Next time, I'll use my actual camera for better progress pictures. Lesson learned. The skin is done? Excellent! Now with the skin all painted, we repaint the eyes with White. Since we're working with thin layers of paint, you'll likely need to do at least 2 coats to get even coverage. And that's important, since the eyes are so big you don't want uneven coverage. First up we want a dark color for the main iris color. For Von Drakk I chose Khorne Red, which is a nice deep red. (Possibly my favorite red of GW's current line). Starting at the upper edge of the eye, we make an oval shape with Khorne Red. We want to fill the eye with the iris, but I always stop short of the bottom of the eye leaving a line of white between the edge of the eye and iris. It's a good idea to look the mini directly from the direction his eyes will be looking. This will help you locate where both irises need to be placed on the eyes. Use your own eye movements as an example in a mirror if you need to as well. Bad eye placement can really put a damper on an otherwise solid paint job. You'll want to make sure its nice and opaque as well, which means doing a couple coats. Also, don't worry if your edges aren't smooth. You can touch it up with white a bit once it's dry. Next up, we want to take a different shade of red and use it for the highlight. This needs to be a bright color, but doesn't need to be overpowering either. For this one we take Evil Sunz Scarlet and carefully draw a J shape just inside of the right edge, starting at the top of the eye. 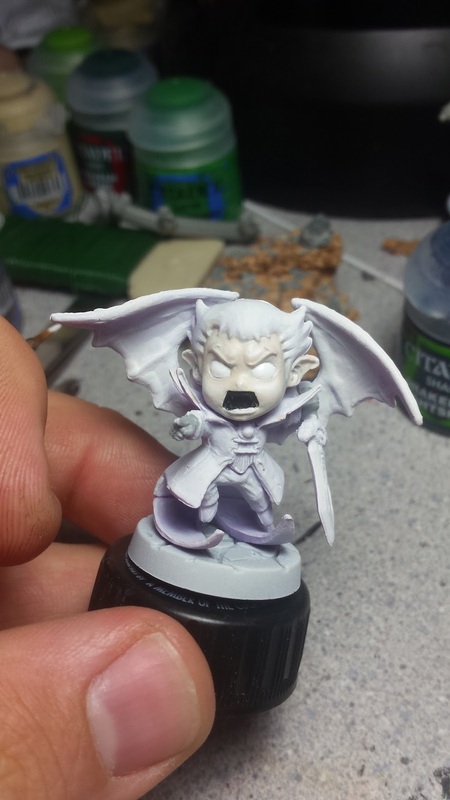 Make sure you only have just enough paint on the brush, as you don't want to accidentally glob it on. If you do make a mistake, it's really easy to cover it up with Khorne Red and try again. Now we take White again and add a reflection dot to the upper left area. You can play with the size of the dot too. This helps give the eye a bit of life and dimension. Finally we paint the upper edge with Black both to cover any sloppiness and to give the character that trademark anime eye look. 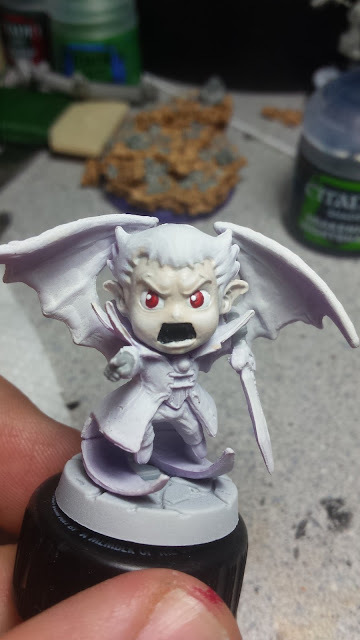 One extra step you could do after this is all finished is to put some gloss on the eyes. I've yet to try it myself, but have been debating on it. And that's it! We now have Chibi eyes, congrats! I finished painting him in the same session. Now with the rest of the mini painted, the color of his face and eyes are more noticeable as well. 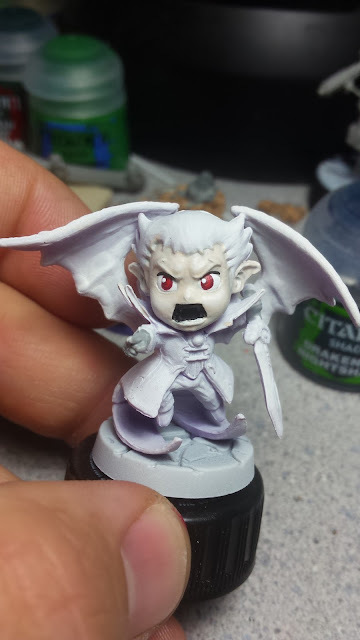 Its possible that he might be a contender for my favorite Super Dungeon Explore paint job so far. My first love will always be the Claw Tribe Barbarian though. 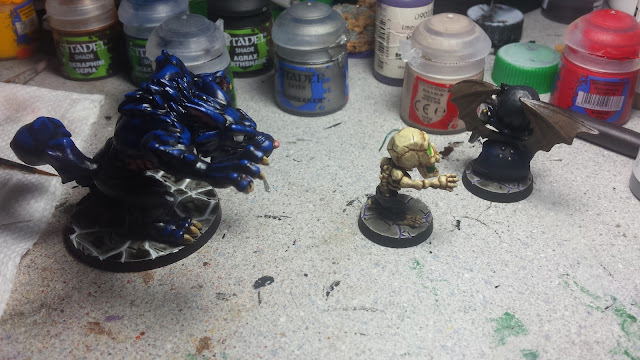 Von Drakk is now ready to vanquish that pesky Von Wilding! Thanks for reading, hopefully it helped you with your own Chibi eyes. If you have any questions, feel free to leave a comment below. Or, you can always catch me on Twitter @ryglore. Until next time!